Call for our best price. Base models start at under $2500. Package pricing is available. The IS-7000 is our “economy” class lift. The low price doesn’t mean low quality though. Compare the IS-7000 with any of our competitors’ four post lifts and we’re positive you’ll be impressed. It features a lifting capacity of 7,000 lbs, and it’s put through the same vigorous 21,000 lbs test as our top of the line SR-7H. All of the optional add-ons for the SR-7H can also be added to the IS-7000 — the caster kit, the chrome pulley covers, all of it. The IS-7000 and the extra long and tall IS-7000XLT are the absolute best choices for a four post lift on a tight budget. Wider is better. 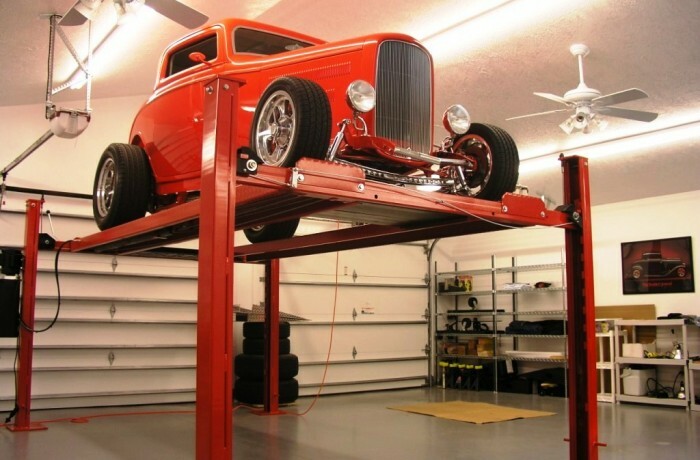 Our lifts offer plenty of between post clearance. The industry’s longest stroke and biggest bore. The most sensible place to keep them. A must for low-profile vehicles. The lifting mechanism is completely hidden. A simple strength and safety feature. Specifications subject to change without notice or liability.